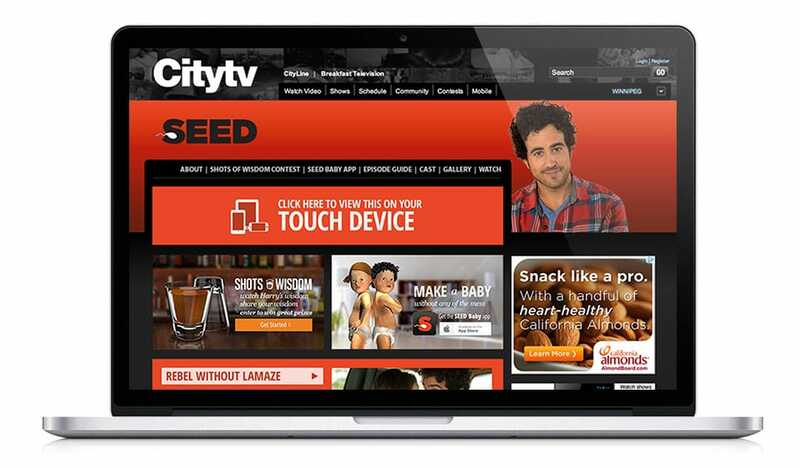 Force Four Entertainment needed an interactive digital media strategy for the first season of their comedy series SEED. First season Canadian television shows need to find their audience to succeed, and scripted comedy faces some of the biggest challenges when it comes to getting noticed. According to Business Insider 25% of television shows are canceled after one season. Other sources put this number even higher. The Canadian film and television funding system encourages producers to enhance and expand their content online in order to engage audiences in a deeper and more meaningful way. Producers benefit by increased funding for their properties as well as the creation of online and interactive digital media content. Force Four and Rogers wanted to develop a robust online presence for SEED but needed advice on what digital media components would work best for their specific project, assistance in accessing the funding opportunities available, as well as a company to execute the digital media plan. The primary challenge was to build an audience for the show and keep them coming back to the broadcast week after week. Shots of Wisdom is an interactive experience that gives the audience a chance to show off their funny and share it with show fans on the website and their friends on Facebook and Twitter. During each episode three new videos were unlocked online featuring the show’s lead character Harry, a wise-cracking bartender. In the videos Harry dishes out a “shot of wisdom” – some funny, often quirky and potentially disastrous life advice. He then challenges the audience to come up with better advice by captioning an image from the episode. Each week the best three audience shots of wisdom won prizes and were entered to win a grand prize trip to LA for dinner with Harry. In addition to designing and implementing Shots of Wisdom, Tactica provided community moderation services and created a powerful automated moderation tool that gave the client full control over what user generated content appeared on the website. During the show’s broadcast window the audience could check in online for a chance to win a trip to LA. By checking in they automatically shared that they’re watching SEED with their friends on Facebook and Twitter – thereby promoting the show and broadcast time to their friends and reminding them to tune in. 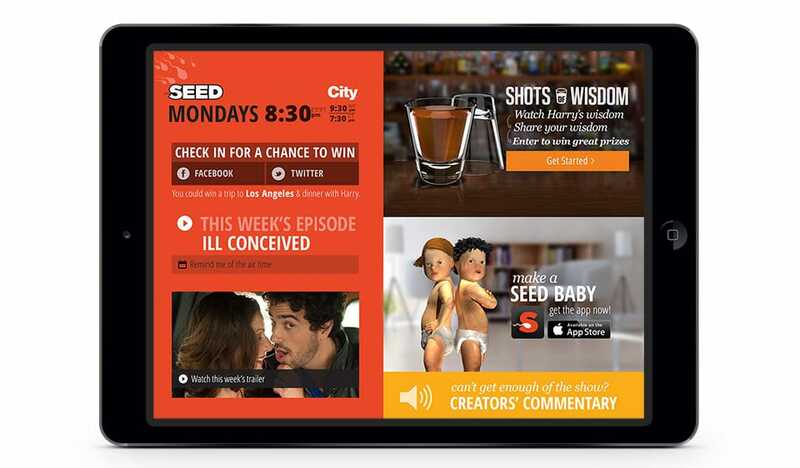 Commentary about each episode by SEED’s creator and cast members was available to audience members online during and after each week’s broadcast, allowing the audience to listen along to the show on their smartphones or computers. The site also included extra video content and details about the show and cast. Tactica created and managed a Facebook advertising campaign for the show that outperformed other forms of online marketing, including YouTube advertising and organic social media marketing. renewal of the show for a second season! City television stations in Toronto, Vancouver, Calgary, Edmonton, Winnipeg, Saskatchewan, and Montreal offer viewers intensely-local, urban-oriented, culturally-diverse television programming. City is a part of Rogers Broadcasting Limited, a division of Rogers Communications Inc. (TSX: RCI and NYSE: RCI) which is a diversified Canadian communications and media company. Force Four Entertainment has produced more than five hundred hours of television including The Audience Canada (W Network), Border Security (National Geographic), SEED (City TV), and Million Dollar Neighbourhood (OWN). They’ve earned the prestigious Peabody Award for “Significant and Meritorious Achievement in Broadcasting,” ten Gemini Awards and more than twenty-five Gemini nominations. Force Four Entertainment, owned by Rob Bromley, John Ritchie and Gillian Lowrey, produces attention-getting programs that make them a leading choice for broadcasters, co-producers, writers and directors.